HIGH OCTANE® Power Fuel® is an advanced, high-energy supplement for all classes of animals being fed and fitted for show. Gradually blend HIGH OCTANE® Power Fuel® with the current ration over a period of 10–14 days until the desired feeding rate is achieved. 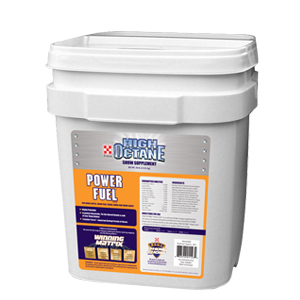 HIGH OCTANE® Power Fuel® is designed to be fed as a topdress to supply additional energy. Rice Bran, Palm Oil, Flaxseed, Dehulled Soybean Meal, Wheat Germ Meal, Ground Corn, Wheat Middlings, Soybean Oil, Cane Molasses, Yeast Culture, Dried Seaweed Meal, Monocalcium/ Dicalcium Phosphate, Calcium Carbonate, Salt, Vitamin E Supplement, Vitamin A Supplement, Vitamin D3 Supplement, Zinc Methionine Complex, Cobalt Carbonate, Ferrous Sulfate, Manganese Sulfate, Manganous Oxide, Zinc Oxide, Sodium Molybdate, Zinc Sulfate, Potassium Iodide, Potassium Chloride, Sodium Selenite, Molasses Products, Citric Acid, Ascorbic Acid, Iron Oxide, Fenugreek Flavor, and Anise Flavor. Daily amount (ounces): Lambs: 4 to 8 Goats: 4 to 8 Swine: 8 to 32 Cattle: 8 to 32 Poultry: 8 per 10 lbs feed CONTAINS: Zinpro provides highly available minerals in proprietary ratios that help immune response and hoof health, which are critical for healthy traveling show animals. Research has shown that TASCO® helps lower body temperature during heat stress – keeping animals on feed. Diamond V® Yeast Culture is a true, full fermented yeast culture developed specifically for optimum nutrition. Research proven, Diamond V® Yeast Culture has the unique ability to enhance ration digestibility, palatability and intake by delivering a rich all-natural nutrient source to the animal’s digestive bacteria.